Posted under Parents' Articles. Updated 11 May 2016. Several years ago, it became clear that too many teens were getting “whooping cough”, also known as pertussis. Although your child got vaccinated for whooping cough when he/she was a young child, the protection often wears off by the time they are ready to go to middle school. That’s why middle schools and high schools have had lots of students with this disease. Due to the rise in the number of cases of pertussis, teens now get a booster shot with tetanus and diphtheria (Tdap) at age 11-12 years old. What is pertussis and how do people get it? Pertussis is an infection that causes severe coughing. The bacteria that causes the infection is called Bortella pertussis. Pertussis is called “whooping cough” because of the “whoop-like” sound that can be heard when someone who has is breathes in cold air. Pertussis typically starts with cold-like symptoms: a runny nose, mild fever, and a minor cough. After 1 to 2 weeks, the cough begins to get worse and lasts for many weeks. Sometimes the cough is so bad that one can throw up. A person catches pertussis if they come in close contact with another person who has it. A person who is infected with pertussis is most contagious during the first 2 weeks after the cough begins. Because the symptoms of pertussis in its early stage mimic a common cold, it is often not diagnosed or treated until more severe symptoms occur, putting many people at a high risk of infection. When a person who has pertussis sneezes or coughs, tiny droplets of bacteria (that one can’t see) go into the air. People who are nearby can inhale the pertussis bacteria, which can then cause whooping cough. Anyone can get pertussis. Babies are at greatest risk since they are not completely protected from pertussis until they get all their pertussis shots. By 15 to 18 months, a child should have received four pertussis shots with a fifth one just before starting school. Teenagers and adults are also at risk because the protection from these early vaccines wears off over time. Anyone living or spending time in close quarters, such as in college dormitories or in classrooms, is at risk for getting pertussis because it is so easily spread from person to person. In the early 1940s, before the vaccine was available, about 200,000 people in the United States got pertussis each year. As you might imagine, after people started getting vaccinated, fewer people got sick. Since then, however, the number of teenagers and adults who get pertussis has increased. This is most likely because the vaccine from childhood wears off over time. According to the CDC (Center for Disease Control) in 2012 approximately 16 million cases of Pertussis were reported worldwide. More than 48,000 cases were reported in the United States alone. Researchers believe that there are still many more cases of Pertussis that go undiagnosed and thus untreated. How can I protect my teen from getting pertussis? 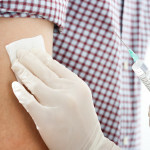 According to the CDC, “The most effective way to prevent pertussis is through vaccination with DTaP for infants and children and with Tdap for preteens, teens and adults—protection from the childhood vaccine fades over time.” The FDA approved the Tdap (Tetanus, diphtheria, acellular pertussis) vaccine in 2005. It is a vaccine created for teenagers and adults to prevent three different bacterial infections: tetanus, diphtheria, and pertussis. Tdap is a booster shot, meaning it will help teens’ immune system fight against infection if they have received the first group of pertussis shots, called DTaP (Diphtheria, Tetanus, acellular Pertussis), when they were younger. DTaP is the pertussis vaccine your teen should have received as a baby and young child. Unlike the Tdap booster shot, DTaP is stronger and given in five different shots at 2 months, 4 months, 6 months, 15-18 months of age, and just before starting school (age 4-6 years). It is necessary to get the DTaP vaccines as a child to help one make the antibodies that target pertussis. Antibodies are small particles created by your immune system to fight infection. The DTaP vaccine is composed of “inactive” pertussis bacteria. “Inactive” means that the part of bacteria in the vaccine is not able to cause an infection. When one gets the vaccine, the inactive bacteria are injected into the body, most often in the arm. The body recognizes the bacteria as foreign and starts making antibodies to fight the inactive bacteria. These antibodies then help protect the body from infection if a person comes in contact with someone who has pertussis in the future. At what age should my teen get the Tdap booster vaccine? It is recommended that your teen receives the vaccine at the 11-12 year old checkup with a health care provider. However, your teen can receive the vaccine anytime between 11-18 years of age. How many Tdap shots does my teen need? Your teen will only need a single booster shot if he already had the first group of DTaP vaccines as a baby and young child. The health care provider should make sure your teen had the first five DTaP vaccinations before giving the Tdap booster shot. How long will my teen be protected from pertussis after getting the Tdap vaccine? It is not known exactly how long the Tdap booster shot will protect your teen from pertussis. Although the vaccine does not prevent pertussis 100% of the time, the vaccine will greatly decrease the chance of getting a pertussis infection. If my teen gets vaccinated and then comes in contact with someone with pertussis, does he/she need to do anything? Yes, it is recommended that anyone who comes in close contact with someone with pertussis call or make an appointment with their health care provider. Your teen’s healthcare provider may prescribe an antibiotic. This will help decrease the spread of whooping cough to others, especially young infants, although the chance of getting pertussis is much less after receiving the Tdap vaccine. It’s very uncommon to have side-effects from vaccines. If you think your teen might have had a side-effect from a vaccine, talk to his health care provider. You can also call 1-800-822-7967 or log on to vaers.hhs.gov. Is there any reason for my teen to wait or not get the Tdap vaccine? Most teens can get the Tdap with no problems. However, there may be a reason why your teen should wait or not get the vaccine. Check the questions below. If you answer yes to any of them, be sure to talk to your teen’s health care provider about whether it is a good idea for him to get the Tdap vaccine. Has your teen ever had a serious allergic reaction, such as anaphylaxis, when he got a vaccine? Has your teen ever had prolonged seizures or other neurologic condition after receiving a pertussis-containing vaccine? Does your teen have a condition or is he taking any medications that suppress the immune system? If so, your teen may not get as much protection from the vaccine. Is your teen feeling ill on the day that the shot is scheduled for? If so, it might be best to postpone the vaccine until your teen is feeling better. Speak to their health care provider to determine if they are healthy enough to receive the vaccine. Is there anything I should ask my teen’s health care provider before my teen gets the vaccine? Yes. It’s a good idea to ask your teens’ health care provider the following questions so you can learn about your teen’s vaccine history. Did my teen receive the first group of DTaP vaccines as a baby or young child? Are there any medical reasons why my teen should not get the vaccine? When should I call the health care provider if my teen does not feel well after getting the vaccine? What if my teen comes in contact with someone who has whooping cough? We hope that this information will help you make positive health choices for your teen. Talk to your teen’s health care provider about whether the pertussis vaccine is a good choice. The vaccine is a great way to protect your teen against whooping cough.